﻿ Robe's Pension House, Cebu | FROM $15 - SAVE ON AGODA! "the hotel is very good, highly recommended :)"
Have a question for Robe's Pension House? "It's very affordable and the staff are very accommodating." "The staff's are very accommodating." 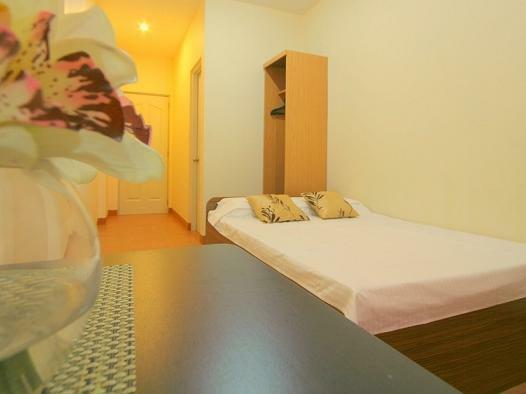 Robe's Pension House, located in Cebu City, Cebu, is a popular choice for travelers. From here, guests can enjoy easy access to all that the lively city has to offer. For those of you who want to venture out, Central Bank of the Philippines Cebu, Santo Rosario Parish Church, St Vincent General Hospital are just some of the attractions available to visitors. At Robe's Pension House, every effort is made to make guests feel comfortable. To do so, the hotel provides the best in services and amenities. Guests of the hotel can enjoy on-site features like 24-hour room service, free Wi-Fi in all rooms, 24-hour front desk, express check-in/check-out, luggage storage. Guests can choose from 36 rooms, all of which exude an atmosphere of total peace and harmony. The hotel's recreational facilities, which include massage are designed for escape and relaxation. Robe's Pension House is an ideal place of stay for travelers seeking charm, comfort and convenience in Cebu. The staff bent over backwards to please you. I was there during their first anniversary of opening and was getting free food and snacks from the reception desk. You are only about a mile from Robinsons mall which is about 60 peso in a taxi. It is very clean hotel with several eateries close by. You get what you paid for. I would have been great if they had free hot water for beverages. The rooms aren't like those in 5 star hotels but they do make up for cleanliness and great service! It's very affordable and the staff are very accommodating. Would definitely stay here again when I come back to Cebu! Good recommended place to stay staff are good the guard is very helpful the location is not bad the pension house is clean, quiet and a good price. I been in hotels that was not as good as Robe's but be prepared to use taxis to travel around I prefer Ken taxis I used them every time I been in Cebu and never had cause to complain over price.... overall I enjoyed the time there thank you for a pleasant stay. Localization in a little ugly place (but the city is all ugly..), but was ok for one night. They arrange pizza delivery and have some snacks to sell for reasonable price, and during the day is pretty to go out and find places to eat around. Very nice and friendly Staff, also helpful. Price a little bit too much. Very comfortable room and bathroom, very clean. We would definetely stay again! Clean, comfortable & accessible to all nearby places/tourist spot. It has been a pleasant stay in Robe's Pension House. We didn't have any difficulty finding it & accessible to all the places we want to visit. The room is very clean & comfortable, we really had a goodnight sleep after a tiring day of travel all day. The staff are very accommodating & easy to talk to. If given another chance to visit Cebu again we'll be definitely staying @ Robe's again. This is a good value cheap hotel fairly close to the port and the big SM mall. The room was clean but had a funny smell like someone had smoked in there. Was a bit noisy at times but overall for the price worthwhile. hotel is nice and clean. basic ac, cable tv, hot and cold shower. its very accessible and just a 5min walk to the main road- osmena blvd. no elevator. if you do not want stairs. request to get room on lower floors. i stayed here for 18 nights and i loved it. if you ever get a chance to stroll down to the lobby and have a chat with the staff, you will get a good laugh. it was my cure for my boredom at nights. overall, the rooms are great and convenient in size in that you will never feel cramped and their air conditioning plus their hot water plus their wifi works great. hot water is only available on the 2nd and 3rd floor but they have plenty of rooms and the wifi is actually pretty fast compared to other places i've been to. i loved the breakfast especially their tocino meal and though it was simply made with the tocino, rice, and eggs, it was still irresistible. i would stay here again hands down especially to see the staff again. great people, great hotel, makes you feel at home. In the whole staying we've had absolutely no problems. All wishes had been granted soon and fast. Daily per person one free bottle of purified water (cold from the fridge). We enjoyed our staying there. Bad be course I had just WiFi Some days It Quite clear it the Staff how Block and can't handle i complien about they had not clean the Room for than it was blocked again.. and not say sir or madam to my girlfriend is very bad respect.. Location is close to South bus Terminal. We only book for a night stay because we had to catch an early bus from the South Bus station. The place was ok. The bed for the double deluxe room is small, we wish to have a queen or king size bed since we are tall. Also, it seems that the linens were not changed because there were some hairs on it when we arrived and it didn't smell newly washed either. nice price. many street children around the hotel. good choice to stay just for one night's sleep. no breakfast. if you wanna live in the hotel, remember not to check in the 1st ground. COZ THE AIR IS TOO WET, as well as the bed sheet. The staff helped us change the room to 4th floor and the environment is much better. no elevator is a setback.